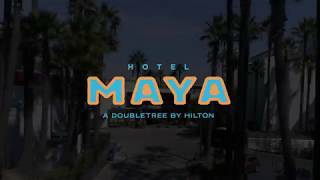 Hotel Maya is a DoubleTree by Hilton® hotel that brings the coastal Latin American resort experience to the Long Beach waterfront. Formerly the Coast Long Beach Hotel, the 11-acre Hotel Maya has recently undergone a $20 million renovation, transforming it into a one-of-a-kind boutique hotel destination ideal for both locals and out-of-town guests. Hotel Maya’s 197 guest rooms are situated in five buildings gracing beautiful resort grounds composed of tropical flowers, an agave garden and more than 400 palm trees. Inspired by Mayan architecture and a Latin American-styled aesthetic, the hotel was designed by Arya Architects and DPS Interiors. Incorporating a bold and vibrant color palette, natural and organic materials, fire and water elements as well as the richness of stone, bronze and copper, Hotel Maya exudes the exotic decadence of a primitive-yet-luxurious resort experience.